Home > Real Estate - Commercial > A review of Indian Retail Real Estate in 2017..! On the supply front, a couple of malls which were to be operational in 2016 are now expected to be completed in 2017. Coupled with the malls withdrawn up to 3Q16, 2016 will have seen a net supply of 2 mn square feet and absorption of 3.4 mn square ft. If the malls withdrawn are not factored in, 2016 will have seen a gross supply of 4.4 mn square feet, with 3 mn square feet of mall space already added up to 3Q16. 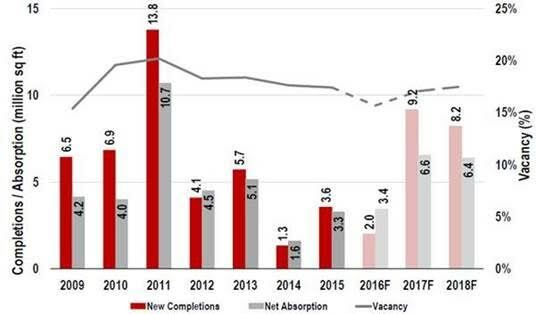 Absorption was nearly twice the supply in 2016, thanks mainly to quality vacant spaces being absorbed quickly. With 14 poor malls getting shut in the past few quarters or getting refurbished into office buildings and shopping centers in Delhi-NCR and Mumbai, the retail space across key Indian cities stood at 75.8 million square feet as of 3Q16. 2017 is likely to see the highest mall space becoming operational, second to 2011. High levels of activity are expected 2017 onwards, after a prolonged slowdown from 2014 that lasted through 2016. This slowdown was the result of very few malls getting completed in these three years, and also due to poorly-performing malls shutting down. All three segments of retail – apparel, F&B (food and beverage) and entertainment & cinema – did well in 2016. High streets and malls saw more and more people eating out, which helped the F&B category. Delhi and Mumbai led this growth. Entertainment and cinema also saw a good momentum. A relatively new format of retailing – the Office-Retail Complex (ORCs) – found favour from retailers and developers in 2016. ORCs offer retailers a higher bang for their buck with comparatively lower rents for prime ground floor spaces in comparison to what premium malls charge, along with guaranteed viewership and higher weekday footfalls than comparable malls. This format offers developers a potentially higher revenue across a diversified tenant base. It also provides them a key differentiator, which may be the ultimate weapon in commercial occupier retention and future rental upside potential. Various brands like LeEco have filed applications with the Foreign Investment Promotion Board to set up their company-owned stores across India. Brands are also looking at expanding their production activity in the country - one of the various requirements of the government, in line with the Prime Minister’s Make in India initiative. The domestic consumption story was impacted by demonetization in the last two months of 2016. It led to a 25% hit being taken by retailers, especially in the tier-II, III cities, where the volume of cash transactions is higher. Business is expected to normalize from 2Q17, unless a new policy is announced. GST’s implementation, if well-planned, will prove to be very beneficial to the retail sector. However, if GST's implementation is poor, it could result in chaos and affect consumption again. Retailers would get intensely involved in sorting out the issues that would ensue with a poorly-planned GST rollout, and thereby lose focus on their core business. The Global Manufacturing Competitiveness Index 2016 ranked India at number 11 in 2015, and predicts it likely to rank at number 5 in 2020. The country is now becoming an attractive destination for manufacturing, not only thanks to the ‘Make in India’ programme but also because of the large consumer base and growing middle class. This makes India attractive for manufacturers to set up production here in order to serve the domestic demand. Moreover, the labour cost in India, at USD 1.72/hour, is cheaper than China, which is at USD 3.28/hour. The only challenge is scarcity of quality / skilled labour force. The current government’s focus on upskilling and reskilling is helping. Under the ‘Skill India’ programme, 300 mn youth will be trained in different skills by 2022. Big-time investments, setting up of labour exchange programmes, simulated laboratories, etc. are some examples that show the government’s seriousness in this direction. Private parties such as CFLD (China Fortune Land Development), the Wanda Group, and Japanese investments in an industrial node along the DMIC (Delhi-Mumbai Industrial Corridor) show the level of interest from overseas players in developing large-scale industrial parks in India. There is very evidently growing interest from foreign investors and funds in the logistics and warehousing industry. Some serious players are already on an acquisition spree. According to a recent report in the Economic Times, the largest commercial deal in India – pegged at Rs. 15,000 crore – is in the making between IndoSpace (an industrial and logistics real estate development platform between Everstone Group and Realterm) and Canada Pension Plan Investment Board. In 2016, India jumped 19 positions in the bi-annual Logistics Performance Index (LPI) released by the World Bank. The country ranks 35th among 160 countries, up from the 54th position in 2014. Regulatory hindrances are being addressed, and GST will definitely prove to be most beneficial to the logistics and warehousing sector. Over 12 new warehousing hubs would emerge thanks to GST, apart from an increase in warehousing supply within the existing eight hubs. As the rents charged by organized warehouses reduce, the price advantage that unorganized warehouses presently enjoy will shrink. Demand for organised warehouses will go up and resultantly, more developers could get into the business. Overall, infrastructure development and policies such as Make in India, Digital India and Skill India will help in this sector’s growth in 2017 and beyond.